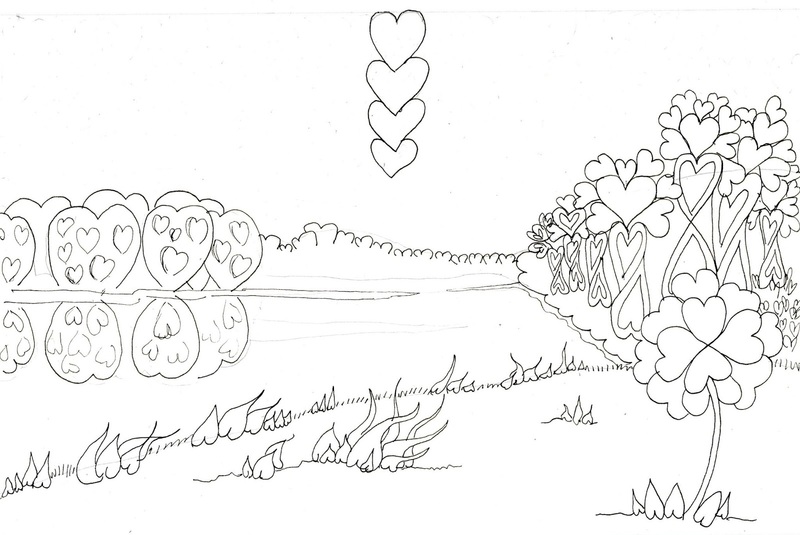 The Friday Fun & Easy Landscape challenge for 2/9 – 2/15 is to create a landscape using Heart-Felt Shapes or Basic Shapes. This is similar to the challenge for the last two weeks, but this time you are challenged to use a photo as a reference. Please get permission to use any photo that is not yours. Your finished work need not be a realistic replica. In fact it shouldn’t be. Because this might be confusing, I decided to do a step-by-step today. I’ll confess right off – I had an idea in my head and I didn’t quite capture what I wanted. But that’s half the fun. I learn while I’m teaching. 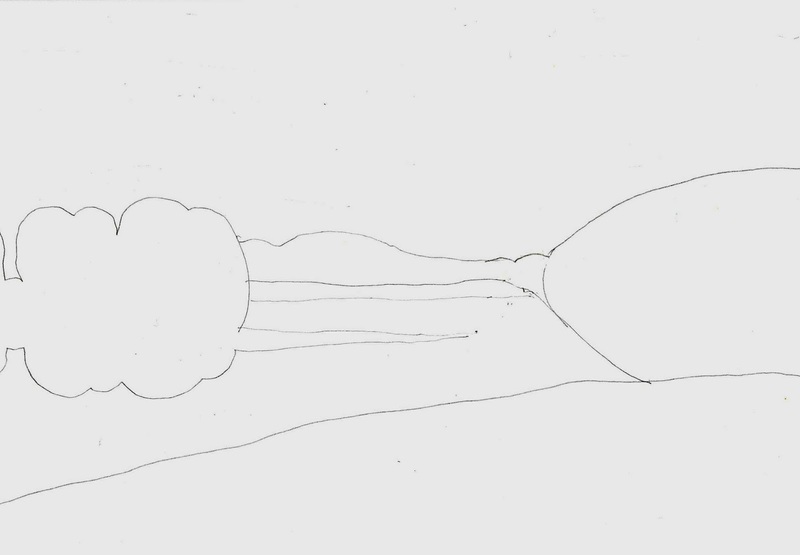 Part of what I want to show you is to recognize what makes you unsatisfied with a drawing. The hope is that instead of thinking ‘I hate this!’ and giving up in frustration, you will think ‘Ah! here’s where I went wrong and here’s where I went right!’. You’ll realize you didn’t do so badly, and you’ll come closer to what you want the next time. 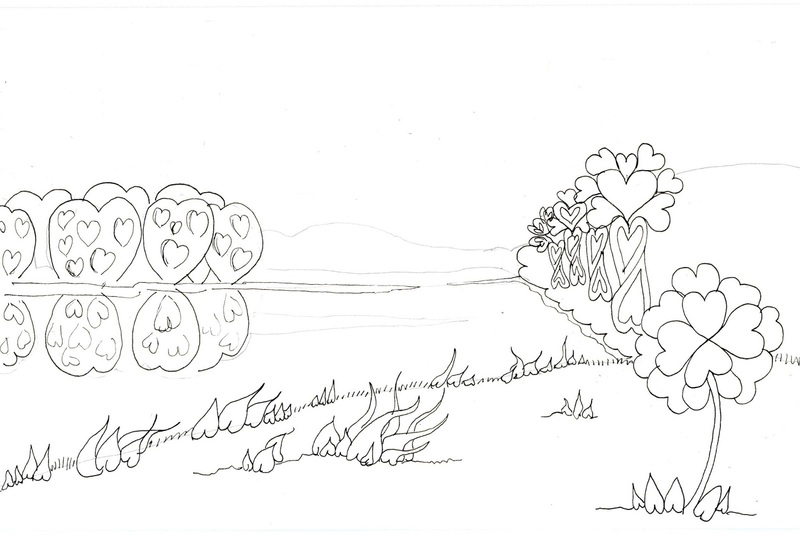 Supplies: I used a Zensations Drafix Pencil to sketch out the drawing, a Zensations .05 Technical Pen to draw the finished work, and Sarasa Fineliners to color them on Grumbacher Mixed Media paper. You can use any pencils, pen and paper you wish. 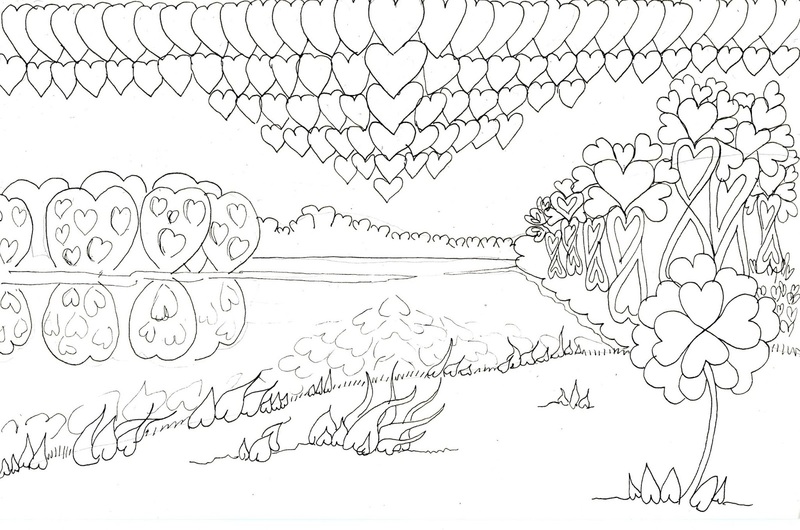 Just make sure you use ones that will be compatible with the medium you use to color it in. 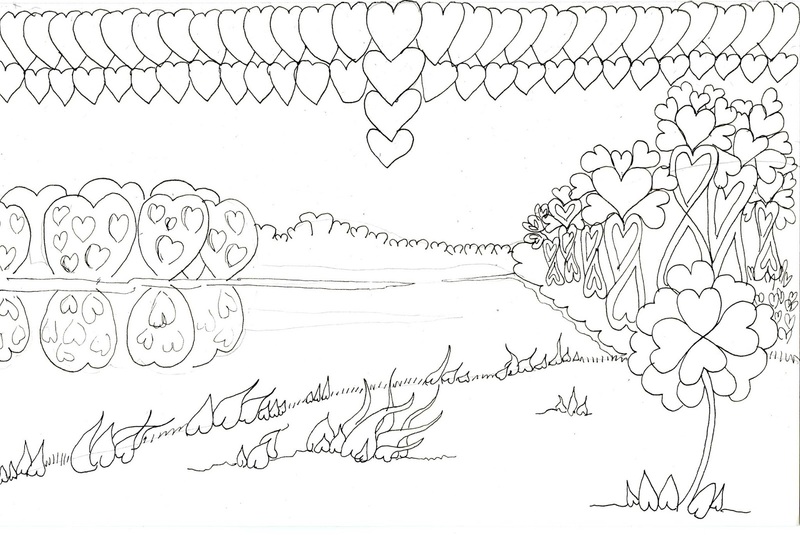 Resources: Today I’m using heart shapes that I presented in my Heart-Felt Shapes step-wisely, and following steps similar to a tutorial I did back in 2013, where I showed how to do a Zentangle-Inspired artwork using a photo as a starting point. Here’s the photo, I’m using as a reference. I chose it because I love the color, the sections are clearly separated, and the shapes are simple. As you can tell from my finished work above, I’m not remotely trying to make a realistic work – this is just a good place to start. Feel free to use this photo or one of your own. 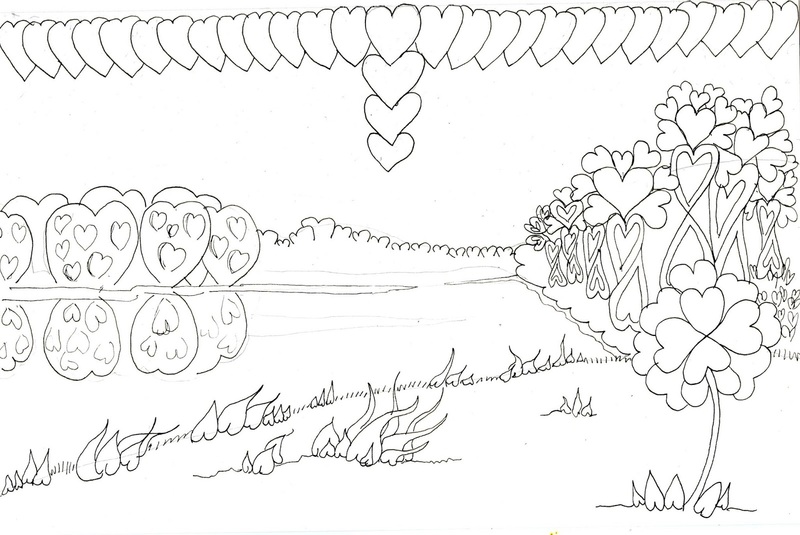 Before we start – I’m using heart shapes because it is almost Valentine’s Day, but you can use any shapes you want. See my Basic Shapes step-wisely) for more help with that. I recommend reading all the way through the steps before starting to draw. I punched up the value in this shot, so you could see my pencil drawing, but you should draw lighter than this. This is a guide so you know where to place things, so keep it simple – just basic shapes. You can always draw more with the pencil later if you need to. Before you continue, think about what you want from the finished piece. What do you want to convey? A particular plant or animal? The way the landscape unfolds? The light? Knowing what you want in the first place helps you make decisions (confession: I like to jump in and just make it up as I go. But that’s harder to teach and more frustrating for a beginner). If you want more control over your finished piece, I recommend using a pencil for all of these steps, and then going over it with pen when you are done. But…but… there isn’t any flower in the photo! The land and trees are all in silhouette! The photo is only a place to start. The silhouettes are too dark, if I want to keep with my theme of heartshapes. I discuss my reasons for adding the flower below, but if you prefer to keep your drawing a little closer to the original photo, you can skip step 2 – YOU have the power! How important is the foreground in this drawing? In the photo, even as a silhouette, you mainly see grass. 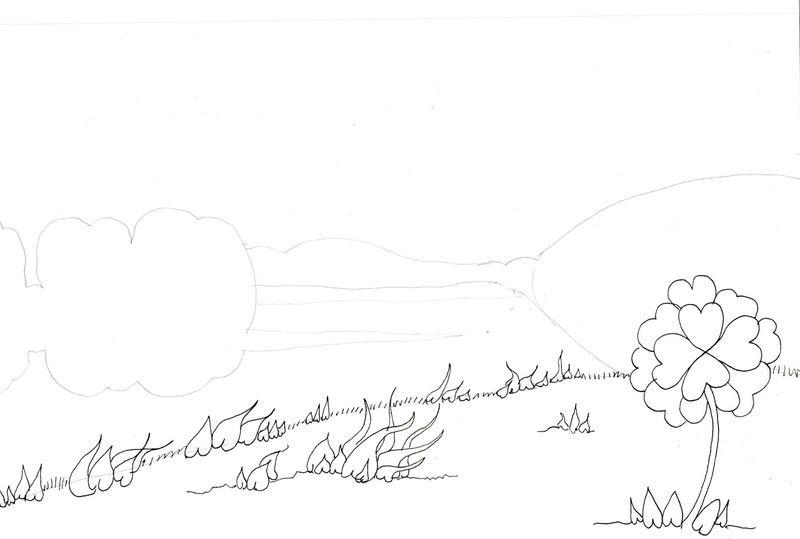 Beyond adding the flower, I decided to stay with grass. In Step 3, I stated that the eye starts bottom left and goes right. It then moves up to the land in the mid-ground and sweeps left. But, when drawing, I like go in a zig-zag. I feel it helps me keep things balanced. You may prefer to do step 5 before doing Step 4. The bridge of land in the middle is the least interesting part of this landscape. I want to know what it looks like on the left and the right so I know how to scale it. The right side is higher than the left. A flat horizon isn’t very interesting. Both the foreground and midground slope downward from right to left. This isn’t a matter of right or wrong, but you should be aware of it. If you change one or the other, you get a different feel to the landscape. In the photo, you only see the tips of trees. I want more detail, but I don’t mind if it is jumbled. Separation will come when this drawing is colored, but mostly I want some of those heart shapes peeking out from a darker mass. You may well ask – why not limit the detail in the first place. That is the best way to go – if you have a clear idea of the detail you want. I’m assuming most of the people who read this won’t have, so I’m drawing much, coloring over. 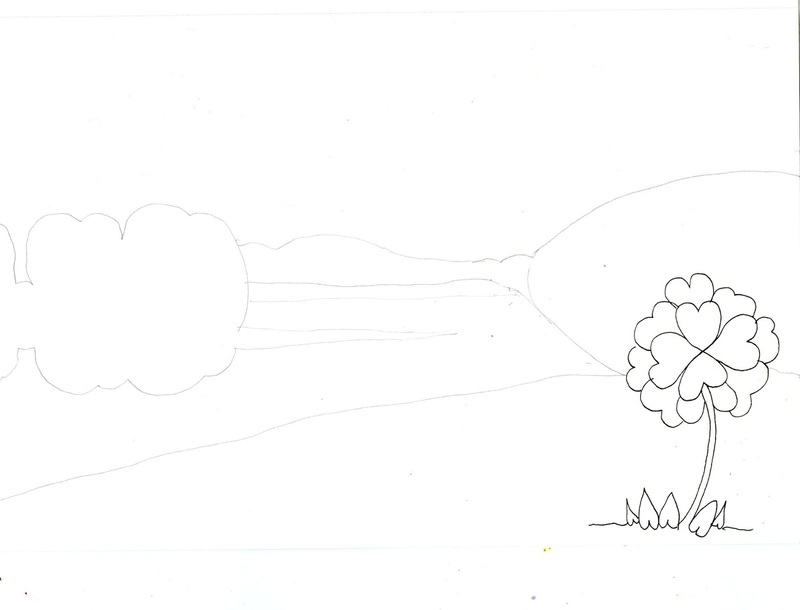 Now that I’ve established the size of the landmass to left and right, I’ll draw the bridge of trees that connects them. I had a good idea of what I wanted in the sky, but not a clear idea how to get it. 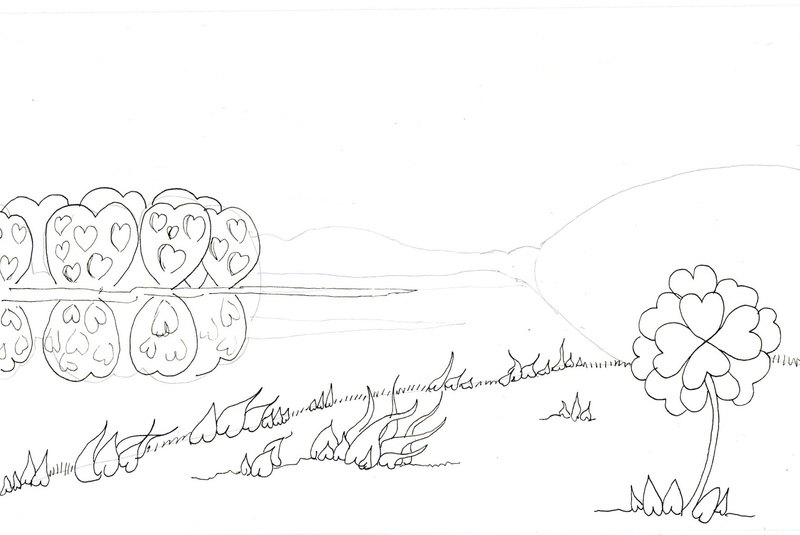 I wanted to get that cottonball clouds feel only with hearts. This is where I’m not satisfied with my effect. I won’t say unhappy. I’m not. But I didn’t quite get the effect I was going for. I ran out of time to play with it and just went with my first try. Maybe one of you will come up with something better. I apologize – I really was rushing at this point to get this done. I also realized at this point that my hearts and the right landmass were going to be closer than I wanted. This isn’t necessarily a bad thing. An artist might want to do this at times, but this is one of the ways where I didn’t get what I was personally going for. I lost the whitespace contrast that I needed. 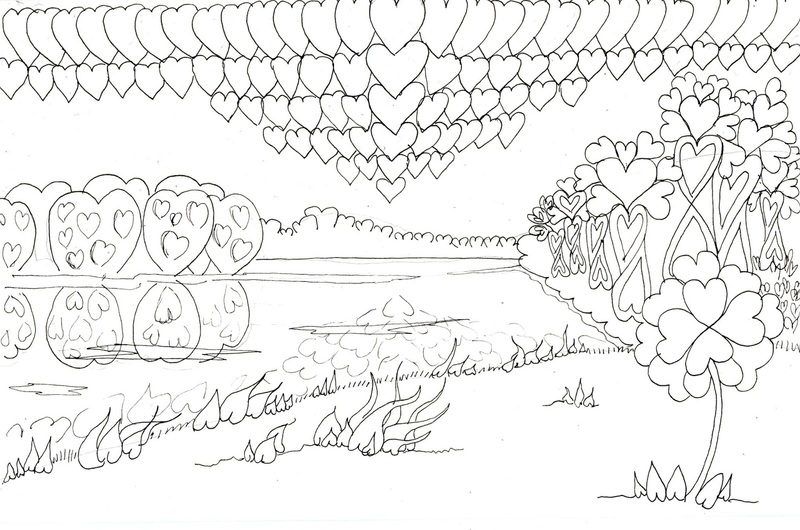 If I had had time to do this again, I would have start reducing the size of the hearts from side-to-side – reducing size with each set of 4 or 5 hearts so they were much smaller at the edges. 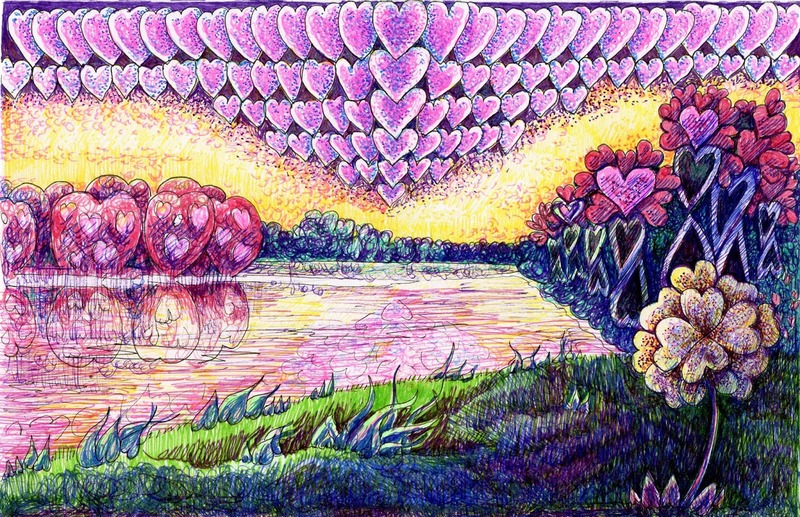 I finish the sky by continuing the rows of hearts. You may want to stop at this step if you don’t intend the sky to be your focus. I debated about this step. 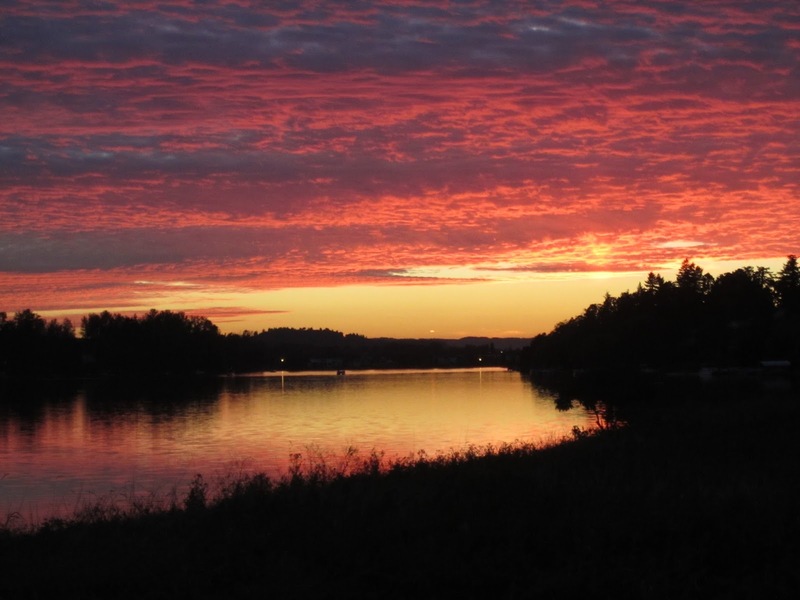 If you look at the photo, it is mainly the lighter part of the sky that reflects in the water. I decided to increase contrast in the sky by adding more detail in the water. To add yet more detail, I added some ripples to the water, even though it is very calm in the photo. I’ve left a lot to be done with shading or coloring up to this point. It all looks pretty cluttered and hard to follow and that will be cleared up by using values. There should be at least three values – light, medium and dark. I had hoped to continue this through coloring, but visiting family and computer problems left me no time. 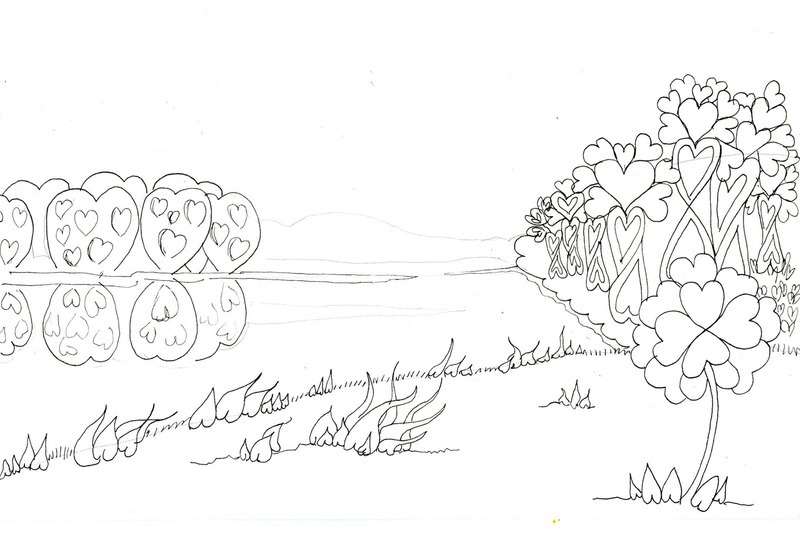 In fact, I would have worked a bit longer on this to make the shoreline more circular and to add more reds to the yellow flower. Note that I decided to add more interest to the foreground with lighting and color shades. If I did this again, I would leave the flower out.